Livestock producers, crop growers, shellfish farmers, environmental groups and Ecology are sitting at the table – together – finding common ground on protecting clean water and supporting a healthy agricultural industry. 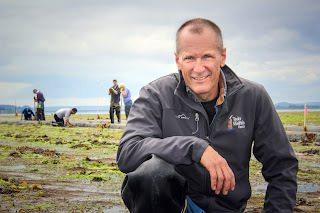 Bill Dewey, committee co-chair, on his clam farm on Samish Bay. Ecology Director Maia Bellon first created the advisory committee to improve our working relationships with the agricultural community. The group provides a forum for open dialogue about complex issues that affect the industry and how they intersect with efforts to prevent water pollution. “Our state is making huge strides through collaboration, which allows us to reduce conflict and have open dialogue on difficult issues. Bringing people together leads to solutions that stick,” said Dewey at the October meeting. As a shellfish farmer, Dewey brings a unique perspective to the group as part of an industry that is directly affected by pollution flowing downstream but who also understands the daily challenges of farming. Clam farms need tractors, too. 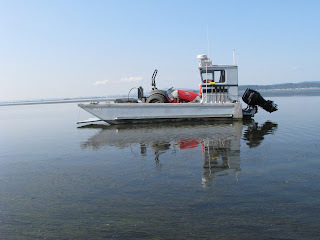 Dewey's boat, The Clamdango, is used to bring a tractor back to land. Polluted runoff from our streets, forested lands and farms can carry nutrients, bacteria and other pollution into our lakes, streams and rivers. Preventing this type of pollution is our greatest challenge to restoring the health of Washington’s waters – a public resource. Bellon relies on the committee to connect with real farmers and ranchers who provide valuable feedback on our work. The meeting is also an opportunity to talk about priorities for future years and share local success stories. Committee members don’t always agree, yet the group remains committed to exploring innovative ways to ensure clean water for farms, clean water for communities, and a healthy agricultural industry. on top of Steptoe Butte looking at farm hills in the Palouse region. “One of the most important aspects of this committee is the opportunity for face-to-face interactions. Personally engaging with those directly affected pays tremendous dividends to all of us. I recognize and value that it’s not enough to simply talk about what needs to be done. The how can be just as important. I believe we’ve made real progress,” Bellon said. For more information on the committee and the meeting schedule visit our Agriculture and Water Quality Advisory Committee webpage.